I couldnt help myself, I had to take this new baby out for a run. * Installs a hook procedure that monitors mouse messages. * Installs a hook procedure that monitors keystroke messages. Ok – so it drops a file, deletes itself & does a couple of google queries, installs a key & mouse logger …. but the important one is that it checks for debuggers ….. damn – ive been caught time to rollback the VM snapshot & try another way. Before I run it outside the sandbox, I grab a registry snapshot with regshot & fire up wireshark. ok …. so its not registered …. although I wonder what it would do it it could reach that domain / url…. [2013-01-23 14:51:52]  [http_80_tcp 1641] [10.6.6.1:1063] info: Sending fake file configured for extension ‘php’. [2013-01-23 14:51:53]  [http_80_tcp 1642] [10.6.6.1:1064] info: Sending fake file configured for extension ‘php’. 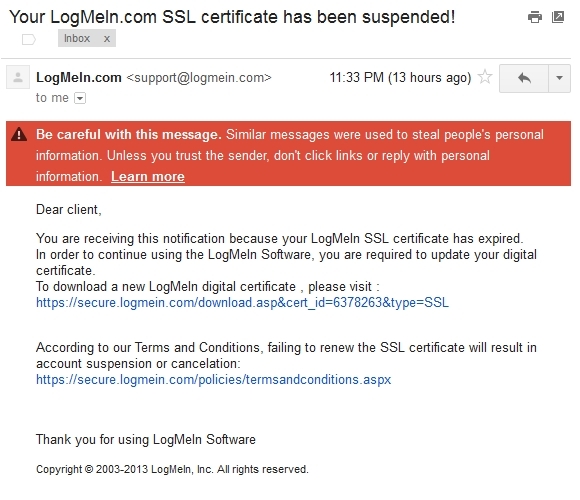 So there I was, happily reading email when I received one that said my LogMeIn.com SSL certificate had been suspended ….. my initial thought was WTF ? I dont have a LogMeIn.com SSL certificate, after opening the mail, seeing the alert that Google had kindly provided & then viewing the source of the email, seeing that it links to a zip file, my spidey sense was on full alert…. So off to the google I went & sure enough, the first couple of hits are LogMeIn “Investigating” and a Threat alert from Cisco. So anyway, back to the content, the link in the email to download a new SSL certificate is actually a link to a ZIP file. Note, the site is now requesting a login to get to the link. another quick google & we see that this file has hit the malware & virus check sites already malwr.com and virustotal. So even without executing this guy, I can already tell its neither my “expired SSL cert” nor is it an screen saver (per the scr file extension). I plan to run this in a sandbox & see what else I can find, several sites are reporting it phones home, and virustotal is flagging it as Zeus / zbot – so remote control and/or banking credential capture …. nasty little bugger. Interestingly when I downloaded the zip & scanned it with MS Security Essentials – no virus reported ….. wonder how long it will take to get a sig down for it.